This post has nothing to do with baseball, but about the best athlete I have ever seen or met. 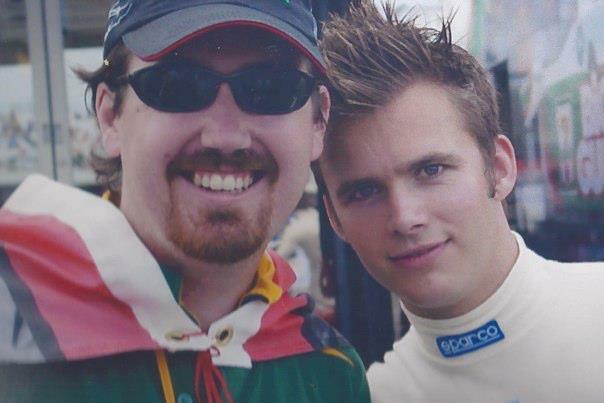 My all time favorite race driver, Dan Wheldon, died on Sunday. I am in shock. I was in denial on Sunday, and cried most of Monday. I'm still too upset to convey how much his death effects me. I know I will write about him in the future, but I can't do him justice now. Dan, you were by far the best race car driver I have ever seen. It was a riot talking to you those several times in Richmond. Your charisma and antics were strong enough to disarm even me. I will miss your presence immensely, and I am devastated for your family. Please read this wonderful writeup about Dan's life and career. He was much more than a smile and a driver. that was one of the worst things I have ever seen. First, Gilles Villeneuve. Then Dale Earnhardt. Now Dan Wheldon. Three is enough for me thank you. I really don't want to stop watching racing. Still stunned and heartsick. After the initial shock, my first thought was of you. What a lovely person he was, in many, many ways.